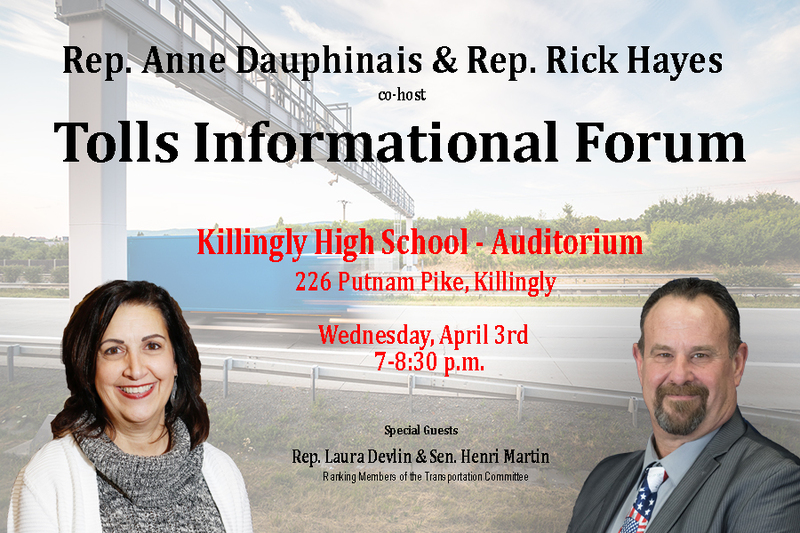 KILLINGLY – State Representatives Rick Hayes (R-51) and Anne Dauphinais (R-44) in conjunction with State Senator Henri Martin (R-31) and State Representative Laura Devlin (R-134), Ranking Members of the legislative Transportation Committee are inviting the public to attend an informational forum on tolls. WHEN: Wednesday, April 3rd from 7:00 p.m. to 8:30 p.m. Investing in and improving Connecticut’s transportation infrastructure is a priority among all lawmakers. With the Governor’s recent budget address including more than fifty tolls expected on all major highways across the state, this event will allow area residents to share their concerns, get their questions answered, and discuss potential alternatives.